It may be only four feet in height, and sixteen inches wide on any side, but, both for the children who will see it and for the meaning it represents, it is truly monumental. “It” is the small but very significant monument which was unveiled on July 1 at Sherdavia Jenkins Peace Park, located on Dr. Martin Luther King Jr. Boulevard (NW 62nd Street) and NW 12th Avenue in Miami’s Liberty City district, in a special Remembrance attended by Miami City Commissioner Richard P. Dunn, II. The occasion was the fifth anniversary of the tragic death of nine-year-old Shedavia, struck by a stray bullet as she played in front of her home in the historic Liberty Square project (affectionately known as the “Pork ‘n’ Beans”, across the Boulevard from the Park), as two men exchanged gunfire on July 1, 2006. In keeping with the spirit of that remembrance, the names of 109 children whose lives were lost to gun violence just during Sherdavia’s brief lifetime were read aloud. (Indeed, she was the sixteenth child to die of gun violence in that year alone, and became the symbol of all such deaths before and since.) The monument unveiling on that day was of a plain, stucco structure, with an open chamber into which memorabilia from the community could be placed, prior to the top being sealed. That was only the beginning. Throughout the month of July, members of the community-based Kuumba Artists Collective, were busy preparing tiles with hand-colored butterflies and a special tile plaque, which they installed in an all-day collective effort on July 31, with David Jenkins, Sherdavia’s father, on hand to provide assistance. 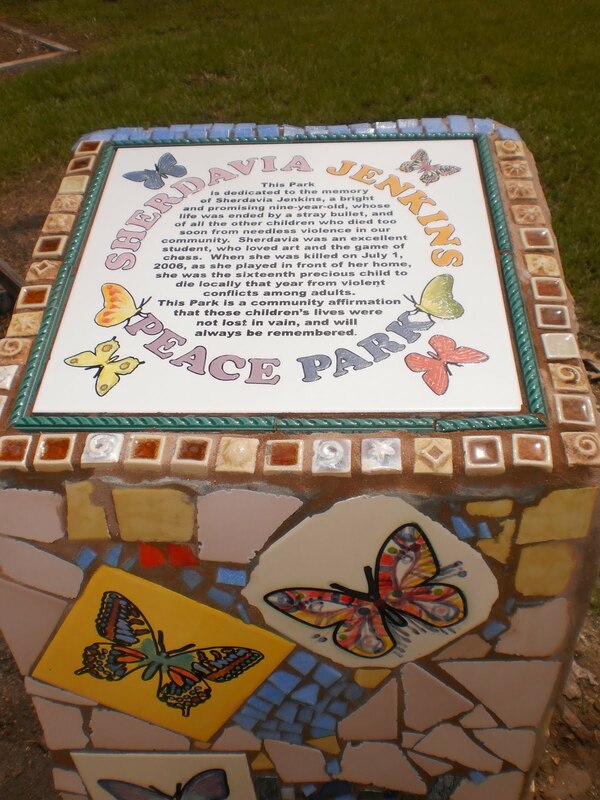 Tile butterflies, broken tiles, beads, shimmering flattened glass balls and other creative bits, along with Sherdavia’s picture, facing the Park, found their artistic way onto the monument, to the inspiring rhythm of jazz music. (Very appropriately, that music included Roberta Flack’s hauntingly beautiful rendition of “Angelitos Negros,” which translates as “Little Black Angels,” recognizing that all innocent children, regardless of their color, go to heaven.) The installation became something of a performing art, with many passers-by pausing to watch, comment, and ask questions. In the weeks which followed, as materials allowed to dry, finishing touches were added and, now, following a final cleaning and sealing, the monument stands as a permanent, joyous remembrance of all of those children who, although taken from us too soon, brought joy into our lives while they lived, and as a tribute to all of the present and future children and families who will visit and use the Park. The monument itself is also just a beginning: Budget woes have halted the City’s plans to fully develop the Mini-Park with artistic fencing and amenities, but July 1 clearly marked a turning point in the history of the Park and the community. Not only was the monument unveiled, but flowers were planted on that occasion which are being maintained by the City; the adjacent concrete bus shelter which was cleaned and repainted by the County is no longer being defaced by ugly promotional posters, and local residents have taken a new pride in the park, helping to keep it clean of trash. Artists and community residents are also looking to the future, exploring ways to acquire playground equipment, build child-sized chess tables (the game at which Sherdavia excelled at her young age), and install memorial brick pavers with the names of the children who died of gun violence during Sherdavia’s lifetime, so that they, too, will be always remembered, and all so that the Park will also become a fitting landmark on Dr. Martin Luther King Jr. Boulevard. Change has come to Liberty City, with the realization that all hope for a brighter future rests with “regular citizens” and what we ourselves are prepared to do, including ensuring that our elected officials understand what it really important. I extend my compliments to you Robert, Gene Tinnie and all of the other members of the Kuumba Artist Collective and community whose efforts made this monument a reality! 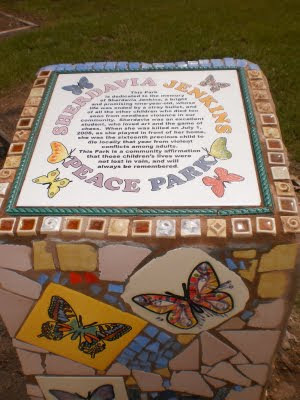 Let us pray that more of our collective future efforts can be spent building small and large monuments to the children that have survived Sherdavia's plight and who grow to leave their POSITIVE marks on this community and black communities worldwide. Very nice. Reposting your photo to accompany the SFLTimes article on Miamiartexchange.com.